At Fine Dental, our Manhattan cosmetic dentists offer effective treatment for these dental flaws. Our patients can undergo the dental bonding or porcelain veneers placement process to achieve a better aesthetic. Here, we review the similarities and differences between dental bonding and porcelain veneers. 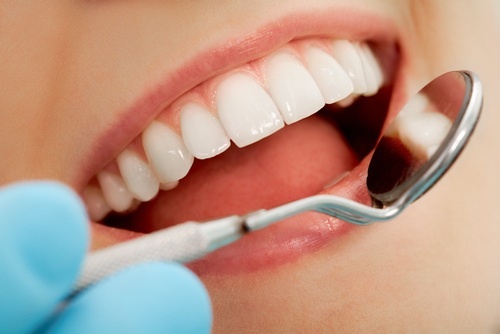 Dental bonding involves the use of the same composite resin material used in tooth-colored dental fillings. Instead of filling cavities, however, the resin is shaped over the tooth to conceal cosmetic problems. The versatile material can extend the length or width of the tooth to treat gaps, chips, and misshapen teeth. It can also be applied over the tooth to cover stains, fill in fractures, and make the teeth appear more evenly aligned. After the composite resin has been applied and shaped, we shine an ultraviolet light on the treated tooth to harden the material and securely adhere it to the tooth. The porcelain veneers treatment process differs greatly from dental bonding. The dental bonding material is directly shaped and cured on the patient's tooth in our office, while veneers are indirectly fabricated from a piece of porcelain in a dental lab. Because the veneers are custom made for each patient, an impression of the teeth is taken to guide the lab technicians in crafting a fabrication that precisely fits on the tooth and produces the look that the dentist and patient have agreed upon. Once the porcelain veneers have been made, they can be securely bonded to the teeth. Dental bonding shares more similarities with the dental filling procedure, while the porcelain veneers process shares more in common with dental crowns. For our patients in Manhattan, porcelain veneers and dental bonding offer good results. To find out if you are a good candidate for dental bonding or porcelain veneers, contact Fine Dental today.